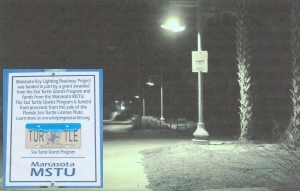 Summary: The goal of this project is to reduce potentially harmful effects, caused by roadway lighting, on marine nesting turtles and hatchlings along Manasota Key (North Beach and Gulf Boulevard), Englewood, Florida. Manasota Key roadway is illuminated with Acorn and FP&L Cobra cut-off lights. Light trespass from these lighting sources causes significant artificial illumination on the nesting beach. This has resulted in habitat loss and poses a potential threat to the sea-finding journey of marine turtles. Modifications by top shielding, raising the light source, and turning off the lights, have been applied with limited effects. Local residents and county officials are concerned for the safety of bicyclists, pedestrians, and motorists resulting from limited lights when shutting off roadway lights. The area is a heavily traversed area adjacent to a public beach and business district. County officials are working to create safe pathways for public use while protecting the nesting beaches.